Google now started a Free App of the week under the Family section of the Google Play store. This kind of of promotion is for the first time from Google. As you may know Amazon App store is offering one paid application for free every day. Apple is giving free application as App of the month. Now Google is also entering to this category. Unlike Amazon Google do not show which is the free application of the week, unless you click on the banner which says Free App of the Week by PBS kids. 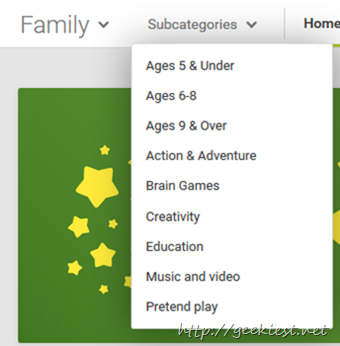 The family section of Google Play store is a way to find family friendly Apps, games and sort application based on your kids age. The Free application available under this FREE App of the Week is Daniel Tiger Grr-ific Feelings, This game will cost $2.99 normally, but now you can get it for free. You can check this application from this link, but to get this for free you will have to visit the family section of Google Play store (link here) and click the “Free App of the Week banner on the page.